Paradise Catering Hall is a Brooklyn institution! For over 30 years we have been hosting Brooklyn’s finest social affairs and have been noted as one of Brooklyn’s Top Catering Halls. It’s a distinction we are proud of. Our attention to every detail and level of dedication show in the extraordinary service we provide you and your guests. The first step towards making your event a memorable occasion that will have everyone talking for years to come, is to contact the Paradise Catering Hall for a personal one on one consultation. Our banquet managers are at your disposal to discuss the details of your party and our facility can accommodate nearly any occasion from Weddings, Engagement Parties, Birthday Parties, Wedding Showers, Baby Showers, Sweet 16’s, Quinceanera’s, School Proms, Corporate Affairs, and Parties for Church and School. Our main goal is customer care and we want to make certain that your wedding or party is outstanding for you and all of your guests. Paradise is one the premiere banquet halls in Brooklyn because we strive to provide the best value, service, and atmosphere for our guests. 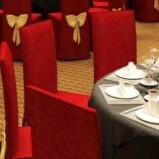 Our banquet facility hosts only one event at a time, and we are completely dedicated to your event. Our personal attention and service has whats been our hallmark for over 30 years. Our world class chefs are ready to prepare a gourmet feast for your banquet. Contact an Event Manager to discuss our various menus and packages.